This chapter focuses on young people, as social discourse has blamed them for the societal breakdown and the rise in crime in Japan. Attention to youth crime is important because of findings from developmental and life course criminology, which suggests that early prevention is important in stopping the development of persistent, serious offenders. We discuss the use of typologies as found in psychological studies in understanding serious, youth violence. The debate on the use of crime prevention is also explored. Kobayashi, Emiko, David P. Farrington, and Molly Buchanan. 2018. “Peer Reactions, Peer Behavior, Student Attitudes, and Student Deviance: A Comparison of College Students in Japan and the USA.” Asian Journal of Criminology. https://doi.org/10.1007/s11417-018-9276-y. Leonardsen, Dag. 2003. 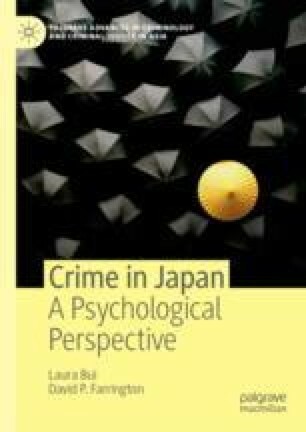 “Crime in Japan—A Lesson for Criminological Theory? The Cultural Dimension in Crime—What Can the Japanese Experience Tell Us?” Accessed 10 June 2011. http://www.britsoccrim.org/volume6/008.pdf.